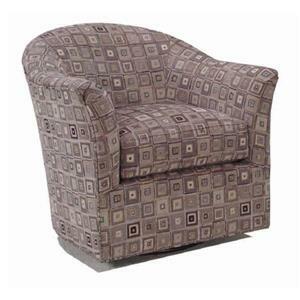 This swivel glider chair is a great conversation starter! 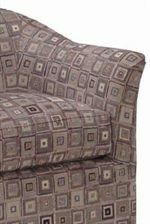 It features a curved back that flows down to the arms that flare out at the end. 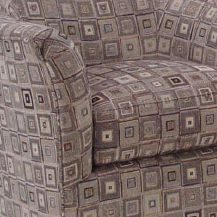 The back is cushioned but tight, so there's no separate back cushion. The boxed seat cushion is ultra plush. Meanwhile, the base glides back and forth and also swivels from side to side, making it easy to see the TV or family and friends. The 0211 Curved Swivel Glider Chair by McCreary Modern is available in the area from BigFurnitureWebsite. Leg or Skirt No visible base. Hidden base swivels.